The Four Ace Trick is deservedly popular. There are many versions, from the semi-automatic to the almost impossible finger-flinging variety, so it's within the scope of every performer. 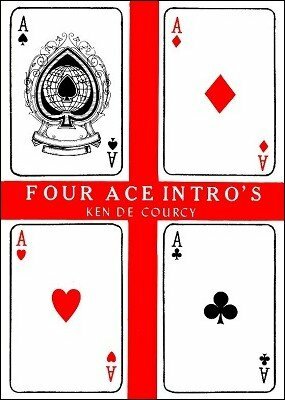 It starts, necessarily, with the abstraction of the four Aces. One can simply run through the pack, locate them and toss them out. Or, if you want considerably more impact, you can produce them magically. That's what this is all about ... producing the Aces in an interesting way as a lead-in to whatever Four Ace Trick you normally do. Here, you'll find both easy and more complicated ways of finding them ... even methods where a little apparatus is employed. Try out the ones that interest you (particularly those that "personalize" the trick from the spectator's point of view), then keep the one you like best. It adds another trick to your repertoire. 1st edition 1983, 1st digital edition 2016, 24 pages.